De Women’s Federation for World Peace (WFWP) wordt gevormd door vrouwelijke Ambassadeurs voor Vrede en is een zusterorganisatie van de UPF, opgericht in 1992 door dr. Hak Ja Han Moon, echtgenote van Dr. Sun Myung Moon. De WFWP en de UPF delen dezelfde idealen voor wereldvrede en harmonie onder mensen. "The Bridge of Peace" is een heel bijzonder project van de WFWP gericht op het helen van historische wonden en universele verzoening. Ending the cycle of conflict by gaining a new perspective is essential to achieving world peace. Women's Federation for World Peace International is committed to utilizing the remarkably powerful Bridge of Peace Ceremony to further peacemaking efforts. The Bridge of Peace Ceremony provides opportunities for individuals to take a meaningful series of steps that result in the creation of a new sisterhood partnership dedicated to and actively working for peace. Ceremony participants meet a peer from a former enemy nation, a different faith, culture or race and commit themselves to bridge the gaps of heart between them. They see beyond collective hurt and determine to reconcile and heal through their one to one friendship. This stops the cycle of conflict, cuts chains of resentment and anger, and frees the newfound sisters to experience a new beginning. During the last 15 years, the Women's Federation for World Peace has promoted a Sisterhood Movement, led by our international founder, Dr. Hak Ja Han Moon. This movement is based on the simple yet far-reaching idea that our world is one global family: parents and children, brothers and sisters, grandparents and grandchildren, husbands and wives under God, our common Parent. Since 1994, Sisterhood Ceremonies have been the centerpiece of this sisterhood movement. We have expanded the global network of sisterhood and friendship using the strength natural to women, of creating harmonious mutual understanding. The first Sisterhood Ceremonies were held in Korea between Japanese and Korean women who came together to reconcile the hatred and resentment still simmering from Japan's occupation of Korea for 40 years until the end of World War II. One hundred sixty thousand Japanese women flew to Korea to overcome the chasms of anger and pain of the past to become sisters and friends with their Korean counterparts. 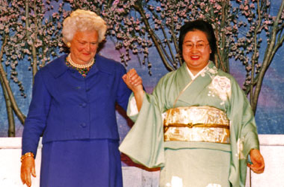 In 1995, commemorating the fiftieth anniversary of the end of WWII, the Sisterhood Ceremonies were taken to the United States. This began the era of the Bridge of Peace, as a special bridge was crossed by the participants. Each participant approached the center of the bridge to meet and embrace her new sister. 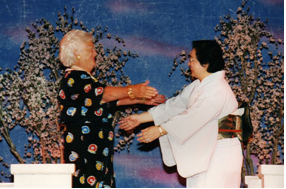 Twenty thousand sister pairs were formed through Bridge of Peace Ceremonies in cities around the United States. In the following years, this movement was further refined and featured in a broader range of contexts with the same inspiration and impact. Through the power of ritual, this almost magical bridge ceremony brings about personal and profound revolution of heart that results in women and their families being liberated from debilitating hurt, resentment, hatred, and guilt. The Bridge of Peace Ceremony is an innovative beginning point for bridging the differences between people of different cultures, ethnic groups, religions and nationalities. Husbands and wives have even crossed the Bridge of Peace to recommit and strengthen their marriages. The Bridge of Peace ceremonies continue to be an innovative and powerful contributor to the ongoing weaving of an effective worldwide grassroots network of women dedicated to creating peace in the daily lives of our families, communities and larger world. Each of us has the power to make a difference. This belief is empowering and challenging because it places the power to affect world peace in each person's hands. We cannot leave the task to governments alone. Governments are systems formed to act for the public good and they have their responsibilities. However, most of us live our lives in the day-to-day moments, affected by our own perspective and approach to life and change. This is what WFWP focuses on through the Bridge of Peace. Solutions to conflict have little to do with the human tendency of faultfinding. Through the Bridge of Peace Ceremony, WFWPI emphasizes finding solutions by taking responsibility for ourselves and making sincere effort to care and take responsibility for one another. By taking this approach to conflict resolution, we draw out the best in one another, ennobling and strengthening each person in remarkable ways. The Four Pillars of the Bridge of Peace. Responsibility: We break the chains of our resentments and anger by realizing these emotions poison and debilitate us. Our attitudes, thoughts and mindset are more essential than our external circumstances. As we take responsibility for our mindset and determine to begin anew, we can be liberated from the effects of past or present hurt even if our basic circumstance is unchanged. Respect: By recognizing the rights of the other, no matter who they are, we are able to open our minds to the possibility of a solution. Without respect, the only answer is death of one kind or another and the perpetuation of the cycle of conflict. Repentance - A Personal Cease-fire: As we take responsibility, we have the strength to see our own shortcomings and our capacity to disregard the needs and situations of others. To end conflict in our own lives, we need to hold a personal "cease-fire" precipitated by self-awareness, honest assessment of our own actions and a willingness to see from the viewpoint of the other. Commitment: As we embrace our partner of peace, whether new sister, spouse, friend or family member, we seal our personal commitment to one another and the tasks of self-development and peace building ahead. WFWP members use the “Bridge of Peace” ceremony to tend to some obvious needs for reconciliation: racial reconciliation; the healing of wounds between peoples of nations that have fought one another in wars; between people of different cultures or religions; and also as a way to uplift one of the most rewarding and challenging relationships-marriage. Through gathering together as women, acknowledging our unique feminine natures, and experiencing the Bridge of Peace, we can come to see that each of us has the power and responsibility to contribute to world peace, at a minimum, by one relationship at a time. When we come together as women, sisters, mothers and wives, determined to take action, we become a force of heart and hands that cannot be ignored the world over.